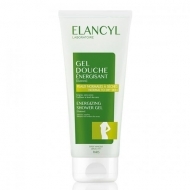 DESCRIPTION: Activ Massage Minceur from Elancyl is a massage gel used in the shower for cellulite situations associated with a feeling of swelling. This method of slimming massage, developed by a kinesiotherapist, was specially designed to favour the smoothing of the skin and to decongest the tissues. 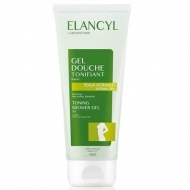 It consists of a massage glove and an anti cellulite gel. Used in the shower. The glove allows specific massages that stimulate microcirculation and favour drainage. Caffeine stimulates fat cells to eliminate accumulated fats. The pilosela drains the water and toxins accumulated in the tissues. In turn, HMC (Hesperidin Methyl Chalcona) will promote firmness, elasticity and tonicity of the skin. The use of the massage glove contributes to the stimulation of the microcirculation, favours the drainage of the tissues, optimizing the elimination of fats and water.